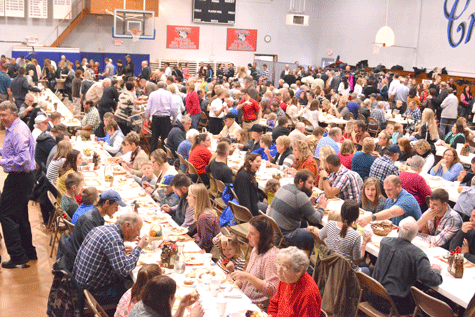 More than 1,400 people feasted on some of the best Thanksgiving foods Thursday at the 92nd annual St. Boniface Bazaar. Lines extended out the front door of St. Boniface gymnasium from the moment the bazaar began through much of the time food was served. Altogether, 1,254 dinners were served inside the gymnasium and another 160 carry-out meals were prepared for a total of 1,414 meals. According to organizers, the total was 464 more meals than last year when the bazaar was held under icy conditions. The total was also 186 more than the number served two years ago. Food Chairperson Sandy Kallhoff shared some numbers which reflect the increase in numbers from previous years. She said 370 people were served with the first sitting, in 45 minutes. She said the 160 carry outs were a record number when compared to previous years. Late that afternoon, raffle drawings were held. The grand prize, a Bose wave sound touch musical system, was won by Judsen Sehi. Logan Henn was the winner of the Yeti Tundra Cooler and Ice Paks. Carol Mescher’s name was drawn for the St. Boniface Quilter’s quilt.